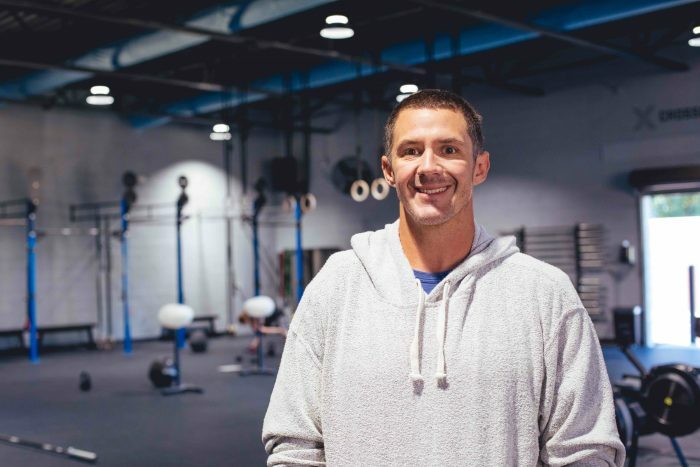 Nick Stallings was one of the first members to join Nexus Fitness and gets most of his exercise in on the CrossFit side of the gym. Nick has lost almost 115 lbs since his vertical sleeve gastrectomy a year ago with the help of his commitment and dedication to working out at Nexus. Q: When and why did you join Nexus? A: I joined Nexus at the earliest possible opportunity, during initial pre-sales, prior to the gym opening. I knew the owner, Chris Wade, from previous exercise ventures, and knew that wherever he went, I would follow. His character, knowledge, passion and personality are infectious, and I knew that whatever he was involved in, I wanted to be a part of it. After a year of working out at Nexus, I still feel this way today. I am more than excited about the team he has built and can’t wait to see where Nexus goes in the future. Q: What inspired you to get your life back/take the initiative to make a change in your lifestyle? A: One of the things that inspired me to get my life back was the way I have felt in the past when I’ve lost a major amount of weight. I have been a chronic yo-yo dieter/exerciser throughout most of my adult life. The most recent time (about 2015) I lost about 50 lbs and weighed 250 lbs. I felt amazing. I vowed not to ever get back over 300 lbs again. I felt so great and had such confidence that I could physically do anything that I wanted to. After putting that weight — and more — back on, I knew that I needed to make a more permanent change. Therefore, I began to explore other options. Q: Walk us through your process of getting and staying healthy. decision to have weight loss surgery. On January 8, 2018, I had the vertical sleeve gastrectomy (gastric sleeve). This was a long process that I worked on for quite a while. After talking with family and friends, I decided that this could be a great decision for myself. While, I know that a surgical procedure may not fit into everyone’s life, it is certainly one of the best decisions that I have made in recent years. Apart from that, I have found that it is important for me to surround myself with people on the same path as myself. I will typically feed off people close to me, so I try to be around people that choose to be active, eat healthy and live a fun, positive life. Q: What was the hardest part? The most surprising? A: For me, one of the most difficult challenges has been trying to make healthy choices when it is not convenient. For example, making the decision to drink water instead of beer at a social gathering or choosing to eat veggies instead chips or other sweets. Often times it is so much easier and more convenient to grab something quick to eat, which will usually mean it is processed and unhealthy. It definitely helps to plan ahead and give myself options so that I am not just eating the first thing I can get my hands on when I get hungry. The most surprising thing for me is how easy it is to stay on track once I start seeing and feeling results. Everyone who has ever tried a new diet or attempted to make changes with their body knows the first couple of weeks are the hardest. But, if you can stay strong and on course, then the cravings and the mental aspect of the journey becomes less obvious. Now, I don’t even want to eat sugar filled treats and eating in excess because I know how bad I will feel afterwards. Q: What role did Nexus have in getting healthy again? Why do you think you’ve been so successful? A: Nexus has been so wonderful in my journey to health because of the great friends I’ve made since I have been here. I typically work out at 8:15 AM, and consistently see the same 10-15 people every single day. It almost like we are our own little family. When someone is out, it’s almost like we’re missing a piece of the team. I think we all look forward to seeing each other and we will typically spend several minutes before and after class talking about life. Q: What advice would you give to people trying to get in a steady routine and maintain a healthy lifestyle? A: One piece of advice I would give–and that I think worked well for me–is not trying to make too many changes at one time. Pick one thing, then work on that for a while until it forms a habit. Once you’ve established a habit, move on to the next goal. Often times, people–myself included–try to make drastic changes to their diet, work out too much in the beginning, get up early, stay up late, read more… do this and do that. That is way too much to try to do at one time. To me, that is just setting yourself up for failure. Pick one thing, make it a habit, then move on to the next. Q: What are you most proud of after this experience? What does living a healthier lifestyle mean to you? A: What makes me the most proud is the fact that I am healthier overall. When I am healthier and in better shape, I am a better husband, father, employee and coworker. I owe it to my family to be the best version of me that I can be. I also owe it to my coworkers and the citizens of the City of Homewood. I am a full-time, career firefighter/paramedic and strive to give them the best version of myself as possible. Being in better shape certainly helps me perform my job at a higher level. life. I no longer take hypertension medication or anti- inflammatory medications, and I am in so much better health. I owe it to my wife, daughter, and the rest of my family to take care of myself so that I will be around as long as possible. Q: Why do you think it is important to share your story with others and the Nexus community? A: I think it is important for me to share my story with others so that people can really see that whatever goals they have, they can achieve them. I made the decision to have weight loss surgery. While that may not be the best choice for everyone, it was the best choice for me. It has not been easy, but I have continued to work my tail off in the gym and the kitchen to maximize the effectiveness of my surgery. The Nexus family has been a crucial part for me and will continue to be. The family atmosphere, knowledgeable coaches and amazing members ensure that I will keep coming back almost every single day. Q: What are you most looking forward to next? A: I am looking forward to continuing my healthy journey. As I have mentioned, I have lost 50+ pounds on several different occasions throughout my life. My focus now, is to KEEP the weight off and continue living a healthy lifestyle. I feel like I have such an amazing opportunity, now that I have my life back, to inspire and motivate others to get out and accomplish whatever goals they have. time than the present to start. Not Monday, not January 1, not the beginning of the weight loss challenge, but NOW. The bottom line is whatever you want to accomplish in life, NOW is always the best time to start.